When first learning about silver bullion, the name Engelhard will come up in researching the best silver bullion in the market. Engelhard minted the most revered silver bars in the precious metal industry, and they are respected as the highest quality and sought after silver bullion available. Engelhard ceased doing business in the early 1980s, yet their bars remain the most popular with investors. At times, Engelhard bars can command a higher price than most all other silver bars and even silver coins. Charles Engelhard established The Engelhard Corporation in 1902, located in New Jersey. Charles continued to pursue additional business acquisitions that enlarged the scope of The Engelhard Corporation. Soon, his fledgling company morphed into the largest precious metal refinery in the world. They specialized in refining and developing silver alloy needed for industrial industries, and Engelhard also holds the recognition of inventing liquid gold that is used mainly for decorative purposes. Business grew and after other mergers and business development, Engelhard Corporation became Engelhard Industries, which invented and produced the first catalytic converter. By 2006, Engelhard Industries was bought by a German company, BASF, and the Engelhard name was eventually absorbed into BASF. The 1970s brought an inflationary period, and the need to invest in solid financial commodities led to the interest in silver bullion. Engelhard started with minting silver bullion bars in weights of 1 oz, 10 oz, and 100 oz sizes. By the 1980s, the appeal of precious metals dissipated and the demand decreased, thus Engelhard stopped making their silver bars. New Engelhard bars are encased in a cellophane wrapper as individual bars, or as flats that contain ten bars in two rows. The bars can be identified and tracked by the unique serial number on each bar. 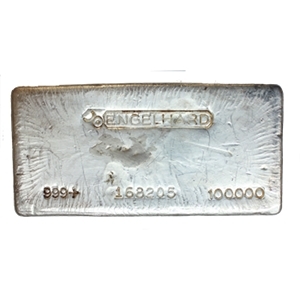 The most popular Engelhard bar is the 10 oz silver bullion bar. Investors prefer these bars for their convenient size and better liquidity. The wide and flat shape makes them easy to stack, store, and transport for shipping. If the need to sell them arose, this size would make an already in-demand bar worth even more. When purchasing Engelhard silver bars, investors will have a difficult time locating them and once they do, the price will be higher than they may want to pay. These bars have no artwork or design desire, but the name Engelhard is a guarantee of their worth. If enough research is done, silver bullion investors can find many other options to purchase silver bullion at a lower cost.